Разстояние до летището 48,6 км. Имате въпрос към Bird of Paradise Bungalows? Разположен в чудесния район Prey Thum, Bird of Paradise Bungalows заема удобно място в ресторанти, плажове център на Kep. Оттук гостите имат лесен достъп до всичко, което този оживен град може да предложи. С удобното си местоположение хотелът предлага лесен достъп до всички градски забележителности, които задължително трябва да се видят. Прави се всичко възможно гостите да се почувстват удобно. Затова хотелът предоставя най-добрите услуги и удобства. Хотелът предлага достъп до широк спектър от услуги като безплатен WiFi достъп във всички стаи, 24-часова охрана, станция за зареждане на електрически коли, ежедневно почистване, таксиметрови услуги. Bird of Paradise Bungalows разполага с 8 стаи, които са обзаведени с вкус. Много от тях предлагат удобства като телевизор с плосък екран, безжичен интернет достъп (безплатен), стаи за непушачи, климатик, събуждане. Хотелът предоставя най-добрите съоръжения включващи лодки, туристически маршрути, шнорхелинг, гмуркане, риболов, които ще Ви помогнат да отпочинете след активен ден прекаран в града. Открийте интригуващата комбинация от професионално обслужване и широка гама удобства в Bird of Paradise Bungalows. Территория отличная, местоположение отличное, уборка каждый день, замена полотенец каждый день, горячая вода. Только по крыше кто-то по ночам бегает, но нам это не мешало. Персонал очень старателен. Хозяин очень отзывчивый человек, я ему очень благодарна. Мне очень понравилось. Pay a little extra and get a room with AC. It's worth it. But there's only a few, so you need to book early. This is a lovely place, tucked away just off the main highway. It's totally quiet at night (if you have a room with AC because there are glass windows to keep out the noise and the bugs). Good WIFI in the rooms, and the bathroom is clean. The owners of this place are super friendly and helpful. They helped us organise scooters, ferry tickets and a transfer to Kampot. The property is within walking distance of the Sailing Club, where you can see the most remarkable sunset, and also a short walk from the Crab Market for delicious and cheap food. The environment here is perfectly relaxed and the owners made everything easy for us. 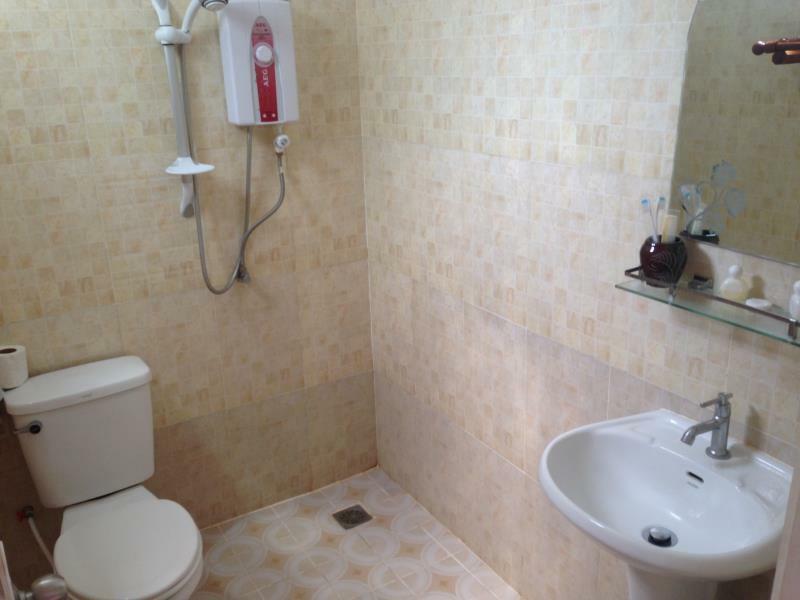 The property is very nice and well looked after. The owners helped us with booking a bus and gave us recommendations where to go for dinner or a day trip. I also liked the dog, cats and ducks they had. It was lovely to walk through the property and see the ducks running around as well. We stayed in one of the wooden bungalows with a fan. It was very nice except for the fact that on our second night we were next to a couple that seemed to want to share their nocturnal activities with EVERYONE else. It made it a little hard to sleep since the bungalows are so close together and open. ... If you have respectful neighbors you will have a nice stay. We might try again, but would opt for the concrete bunglow on the off chance we would have such selfish and rude people next to us again. The hotel itself was beautiful. During night, from 6 PM till 10 PM, there was very loud music. This was due to an camping group in front of the hotel. In the morning, the hotel owner started to do construction work. He promised us the day before that it started not before 9, but they started at 8 already (we explicit asked for a quiet place). When we complaint, he got very angry and shouted at us. He is a nice but moody guy. His wife is a self confident woman with a strong temper, friendly and practical. She is able to justify everything and would have been a good lawyer. We would recommend the hotel. BoP Bungalows is only abt 500m from the Crab Market which is a great place for dining (fresh seafood!) Stephen and Sotheary (hope I spelt her name correctly or Appy) run the property brilliantly with their friendly & hardworking team. Stephen or Appy is always around if we needed anything at all. We fell in love with the lush landscaping and the cozy wooden bungalows that we couldn’t bear to leave... spacious & clean rooms, very comfortable beds (mosquito net provided but not bothered by mosquitoes during our stay), a patio where you can lie in a hammock or sit in a chair to do reading, plenty of local & international TV channels to choose from. You can eat/drink at BoP in-house restaurant, take a short walk to the restaurants near the Crab Market or take a 2-min tuk-tuk ride to eateries at the Kep Beach. One observation was that the Wifi signal was a little unstable or weak if the bungalow is farther away from the reception building. Will definitely choose to stay here again. 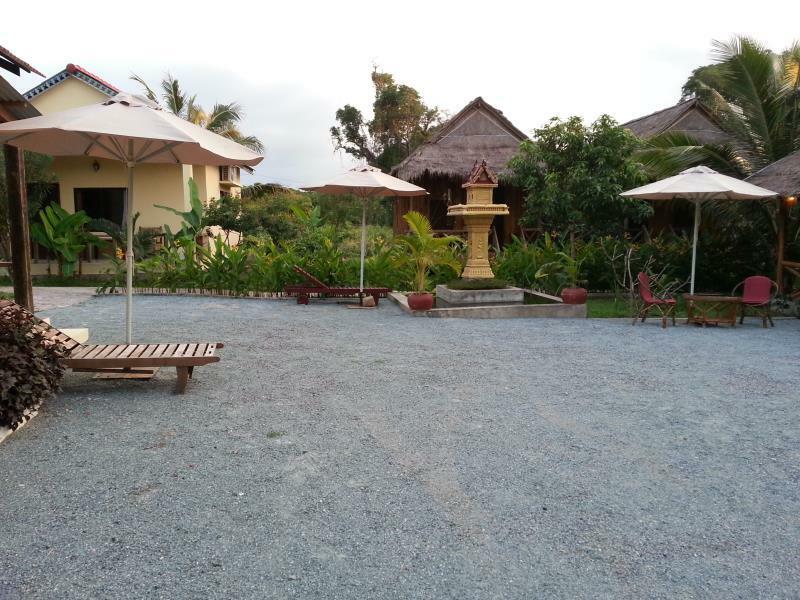 This was the best place we stayed in Cambodia. We booked for two nights and ended up staying for nine!! We just couldn't leave. So clean, comfortable and relaxing. The owners are really helpful and friendly. The setting is lovely in a beautiful garden making each bungalow quite secluded. Set well back from the main road with the National Park a short walk behind. Old single gear bicycles are free to use. They have seen better days but are ok for short rides around the local area. The Crab Market with good restaurants and the most amazing sunsets is just a few minutes walk or a short cycle ride away. The beach area is also quite close and the food is half the price. The straw roof of our bungalow had a few holes in and we had some of the heaviest rain they get during our stay. They offered to move us but the leaks weren't a huge problem and in any case they are due for renovation very soon. A new restaurant/bar area was just being finished and will really add to the facilities here. This place is exceptional on many counts including value for money, absolute cleanliness, location near crab market and upmarket sailing club, and general all round conversation with the owners. We enjoyed this establishment so much that we extended our stay here. I even forfeited a flight and other booked accommodation to stay here for a few more nights. Our total recommendation for here and the locale of Kep. Rooms very clean and spacious. It is close to the crab market. Breakfast. was tasty. Comfortable stay. Is possible rent a scooter, which I recomend to do - Kep is app. 1,5 km far from the bungalows and you can discover other interesting place in the surrounding of Kep. Kep Beach is not the best for swiming. 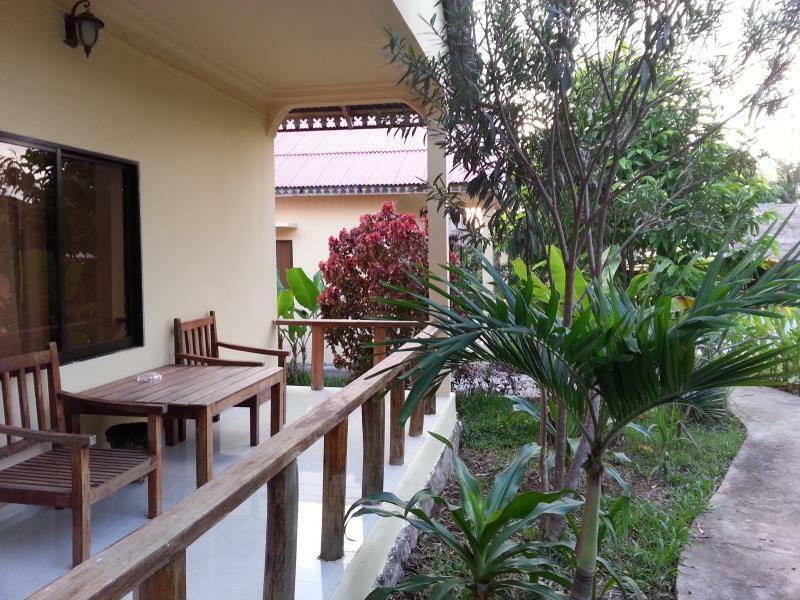 A good choice to stay in Kep. 10min walk to Crab market and National Park. 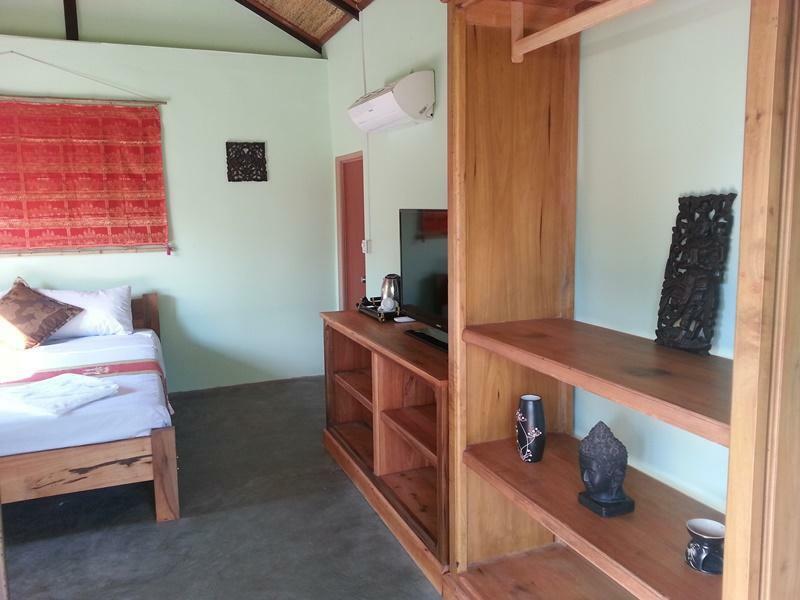 Quiet, clean and spacious room with good wi fi. Owner is friendly. Would stay here again. The only downside is the breakfast is not cheap and the free bikes need some maintanence. I stayed here for 2 nights and found it to be relaxing and enjoyable. Steven is a very nice chap and he will take good care of you as well as give you great information about Kep and Cambodia, in general. If you stay here, you will come to realize that the location is about as good as you will find. It’s near the Crab Market and the beach area. This is important because Kep is a very rural setting and things are pretty spread out. ALSO, it’s very close to the main road which is very important because, while the main road is good, all the roads that branch off of it are terrible....very slow going if you’re on foot....especially with luggage. We liked the hotel and the service very much! The owner is British and super nice, he advised us what to be where to go! Definitely recommend ! Near crab market, the facility has no pool. This place is consistently good and a really enjoyable place for a relaxing sojourn. I booked their brick bungalow with aircon. I recommend these large bright units. Each has its own large front deck with a chaise lounge and table. I knew in advance that the showers are "wet-room" style, and there are no in-room safes. There are plenty of electrical outlets, chairs, and tables & hangers for storage. Also included is a flat-screen TV, a fridge, a fan, and a kettle with tea bags and instant coffee. Two small water bottles are supplied daily. Toiletries include shampoo and soap. Sheets and towels are clean and in good repair. Wifi was strong. Of course in this part of the world, the internet drops off on occasionally. Rooms are cleaned daily once you leave your key at the front desk. One big advantage of properties of this size is the ease of communications. Arranging a moto rental, getting laundry done, booking a bus, ordering a G&T, and other things are handled quickly and professionally. BTW - bar prices are quite fair. At this time, credit cards are not accepted. There's an ATM in the Crab Market down the hill. Great location close to the crab market and the national park. 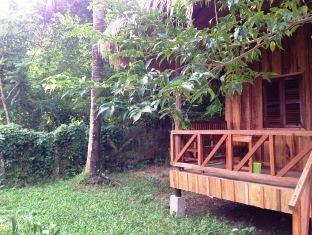 Our bungalow was spacious and clean and the gardens were beautiful. The owner, Peter was extremely helpful in advising us on how to spend our time in Kep and arranged transport for us. Definitely recommend!